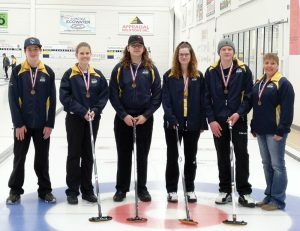 The Willow Creek Composite High School mixed and girls’ curling teams both advanced to zone playdowns, with the mixed team taking home the bronze medal. The mixed team qualified for zones by defeating J.T. Foster of Nanton in district playdowns at the Claresholm Curling Club. The girls’ team was unopposed at districts, so they gained an automatic berth to zones. The zone playdowns were hosted in Lethbridge by Winston Churchill High School. The mixed team opened round robin play on Feb. 4 with a loss to Chinook High School of Lethbridge, then beat Eagle Butte High School 16-5, to finish second in their pool. They advanced to the playoffs on Feb. 5 where they defeated Picture Butte High School 9-6, lost to a team from Lethbridge, then took third place with a 9-1 victory over Medicine Hat. The mixed team consists of Chad Meek, Mardi Kitchen, Taylor Rae, Nolan Wever, and spare Tristan Lane. The girls’ team defeated Chinook High School to start round robin play, then lost to Eagle Butte, to finish second in their pool. They faced LCI of Lethbridge in the playoffs and, although starting strong, they lost to end their run at zones. The girls’ team is made up of Mya Lobreau, Leeyah Elke, Katryna Lytwyn, and Iremsu Kaya.